Being injured is no fun. Especially when your wife hijacks your running club and steals your weekly running slots for herself. Having fallen off my bike in dramatic fashion at the Gauntlet Half Iron Distance Triathlon a few weeks before, I was on the way to recovery but still not in a fit state to race. So it was that Victoria came to be standing on the start line of the 2016 Bright10 10 mile road race instead of me. It’s not often that I take the camera along to a race that I’m not running but I thought I would on this occasion, if for no other reason than to take my mind of the depressing fact that, for yet another year, my ’official – according to Power of 10,’ 10 mile PB would remain the 72 minutes I achieved in the Great South Run of 2011. Annoyingly, I’ve run faster since but none have actually counted as road races. I did 66 minutes at the Hayling Island 10 miles in 2014, but that’s an off-road race. I did 64 minutes in Cardiff this year (2016) but that was during a half marathon. But I digress. I certainly was not envious of the weather when we arrived in Brighton. It was dark, very windy and pouring with rain. The forecast suggested that it was only going to get worse. However, I dropped Victoria at Registration with her friend Claire, and by the time I had parked the car it had stopped raining. Then, remarkably as the start of the race approached, we even caught a glimpse of the sun! Victoria’s plan was to attempt to break 90 minutes for the 10 miles. Bright10 is a relatively flat road course. There is a slight incline on the road out of town past Brighton Marina, and it can be quite windy on the seafront. But, in general, it is a potential PB course. 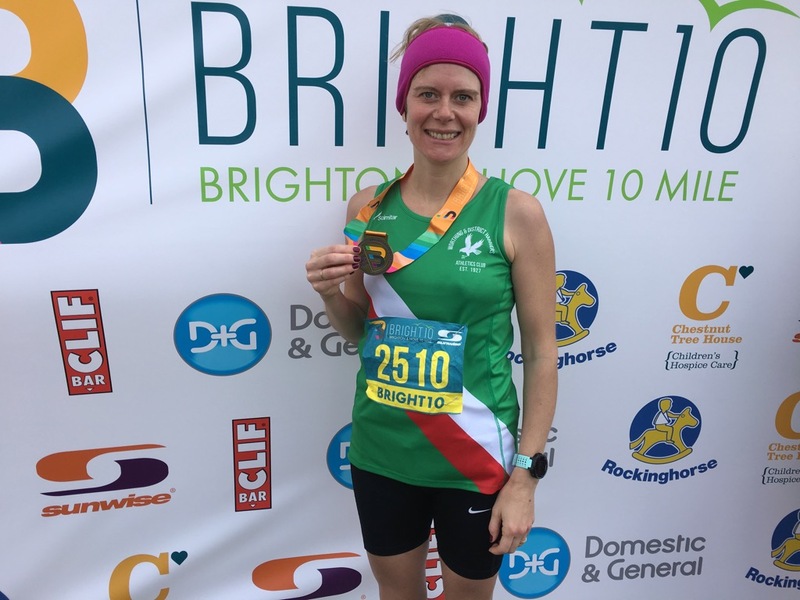 My wife has now officially joined Worthing Harriers and she lined up with a very good turn out of Team Green runners for the second running of Bright10. I set about my usual pre-race filming routine. Unfortunately, the course is such that it wasn’t really an option to walk to different part of the course to film. I could basically be in two positions, the start/finish line and on the road where the runners would pass at 1 mile and 9 miles. Victoria crossed the start line around 30 seconds after the gun and set off for her first 10 miler. Being left behind at the start is a very lonely experience when you’re used to running away from it. Now I know how Victoria feels when she comes out to support me. 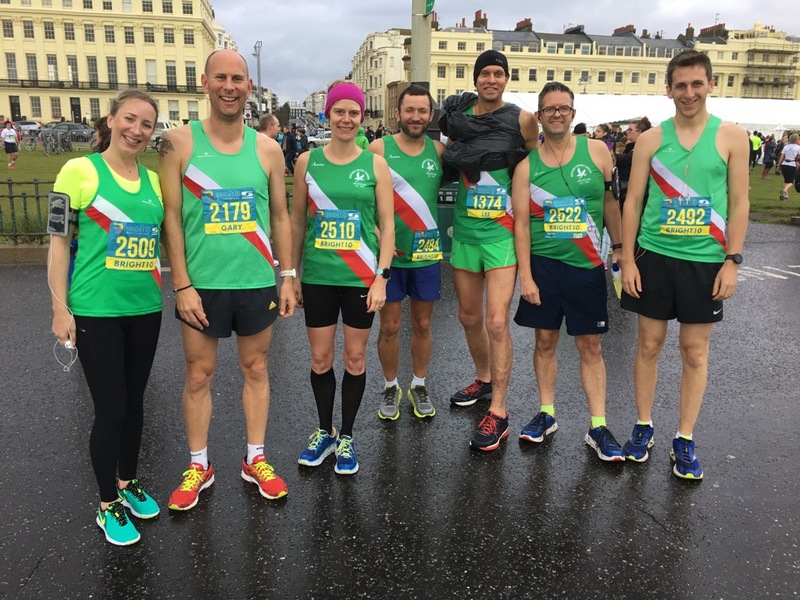 At the one mile mark there was a solid lead pack which included Worthing Harrier’s Martin Freeman. Leading the ladies race was Martin’s other half and also a Worthing Harriers runner, Emma Macready. Victoria looked comfortable as she passed. Normally I would have skulked off at this point to sit in the warm with a coffee, but I spent the time getting some other footage whilst the sun was out. By the time the first runners came back along the road, there was a clear leader. Second place was not too far behind, but there was a large gap to third. Martin was in fourth and Emma was still leading the women’s race. I had to dash across Hove Lawns to catch the podium runners coming in but make it back to the road to film Victoria. First and Second were both Crawley runners. By 9 miles Victoria was tiring and suffering that mental torture where everything is telling you to stop but you know you can’t. I decided to run alongside her and try to give her some encouragement. 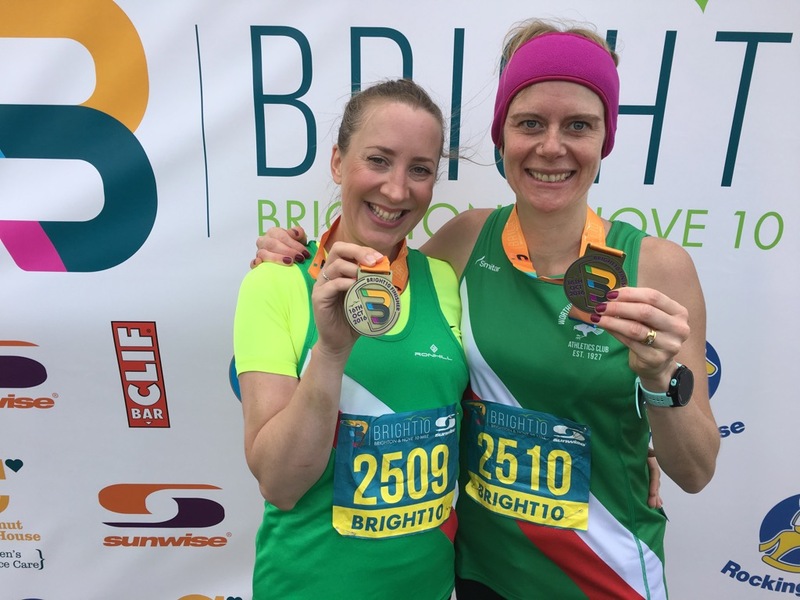 It was actually good for both of us because, as I ran, I realised it wasn’t hurting, which gave me confidence that I could start light training again. I cut across and met Victoria again for the final 400 metres. 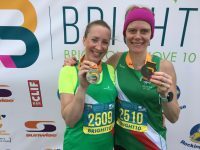 Her initial goal was a sub 90-minute finish, but as we approached the final few hundred metres I knew she was on for around 88 minutes. I shouted at her a bit to push on and she did her level best to sprint to the line. She crossed the line with the clock saying around 1:27:30. It wasn’t long before we realised that of course, that’s the gun time. There followed an agonising wait for the official results to be published. Could she even have got under 87 minutes? Well, not quite. Official finish time was 1 hour, 27 minutes and ONE SECOND!!! Emma Macready took the women first place in 1hr 50secs and Martin did eventually finish in fourth in 55:07, despite a valiant effort to catch Ben Savill in third. 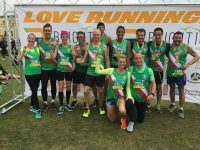 Crawley AC scored a one-two with Paul Navesey and James Westlake taking first and second in 53:11 and 53:47 respectively. 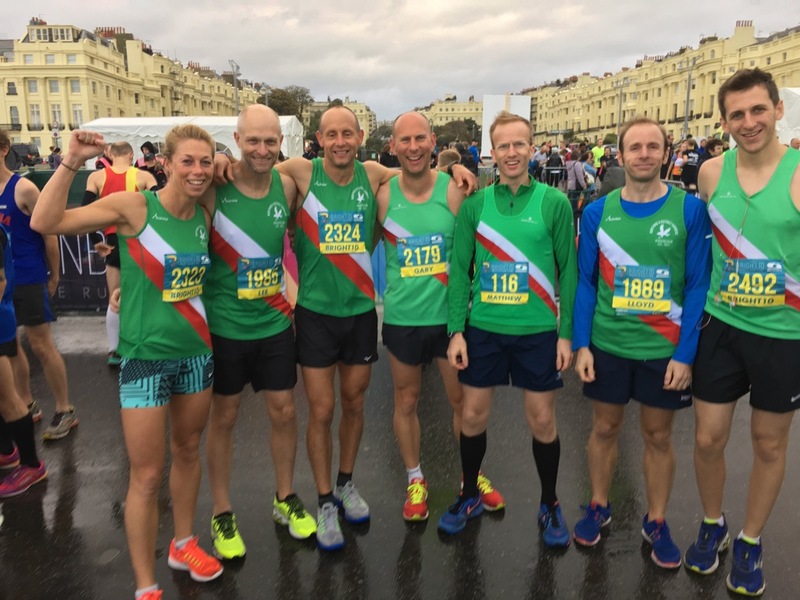 Worthing Harriers Tom Bunce, Lee Jenner, Matt Wilson and Gary Witton all ran under 65 minutes, which is great running. In all there were 22 members of Team Green out on the course. 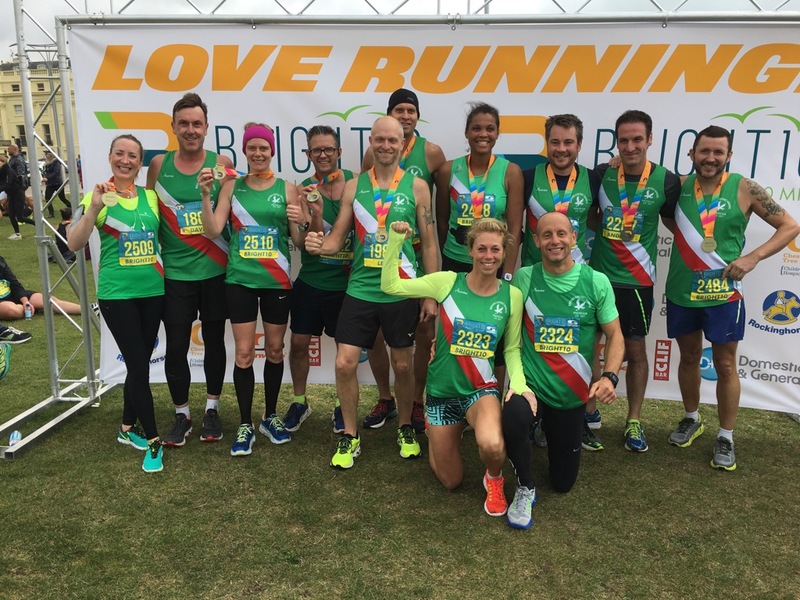 Bright10 is a well organised, cheerful event. 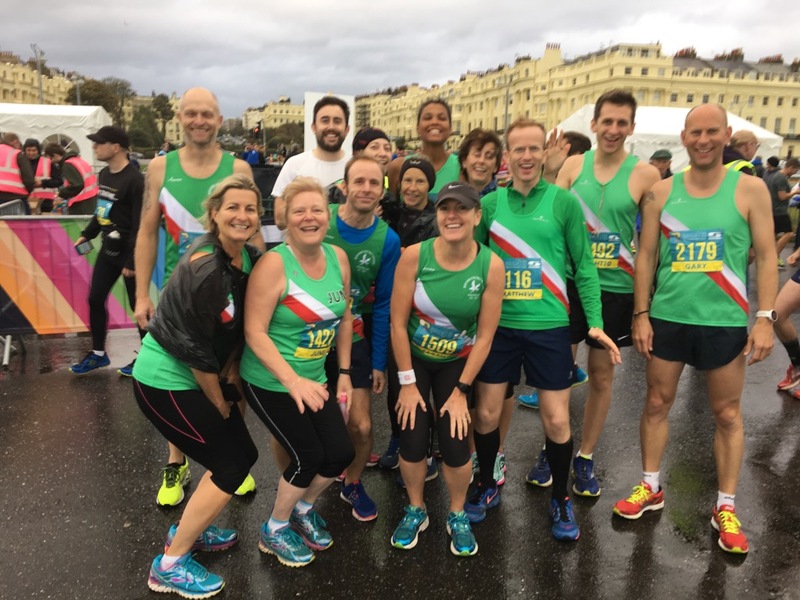 Runbase have done a great job. It’s lots of fun and will no doubt grow bigger over the next few years. Perhaps next year I will finally be able to say goodbye to that pesky 72 minute PB by actually running Bright10 properly. I’m incredibly proud of my wife for completing her first 10 mile distance. She’s a real runner now! 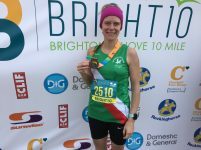 Onwards and upwards for her to the half marathon and then a full 26.2! If you enjoy watching the video please do subscribe to the YouTube channel. You can click here to do that. I’m now composing my own music for each video, which is more time consuming but certainly more rewarding and saves a whole heap of copyright problems! So do watch and click that subscribe button. Thanks!